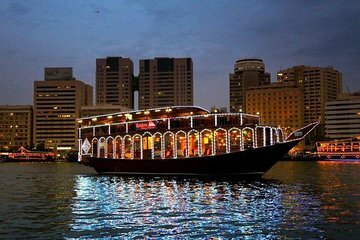 Savor dinner on a Dubai ‘dhow’ during a 2-hour cruise around the city. Aboard the age-old wooden fishing boat, you’ll settle in for coffee, dates and — if you’re not traveling during religious holidays — some traditional Arabic entertainment. As you cruise, feast on an international buffet dinner and admire Dubai’s nighttime sights. A hotel pickup and drop-off service is also included.